The holidays are quickly approaching, and now is the perfect time to start thinking about how you are going to deck the halls for the holidays! Your porch is one of the first places your visitors and even strangers will see when they pass your house. 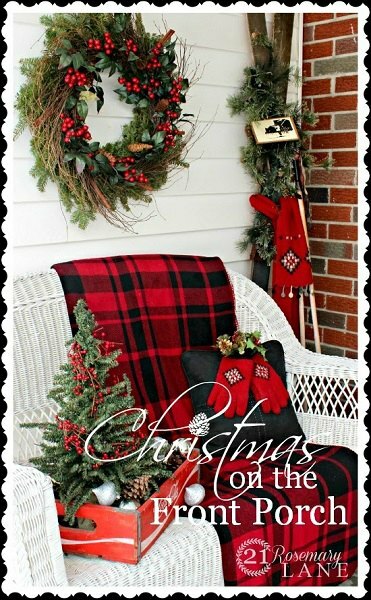 So instead of reaching for the usual lights and figurines, give one of these Christmas porch decorating ideas a try! 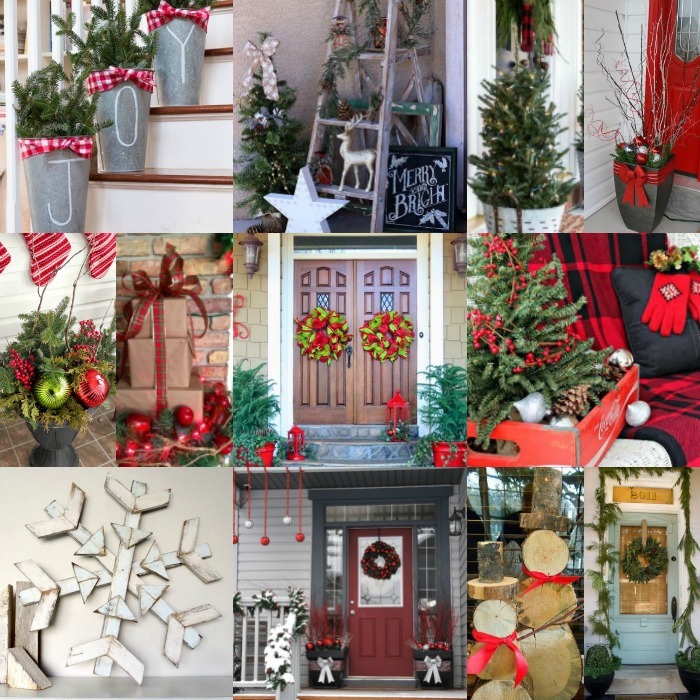 There are so many ideas to make your porch festive for Christmas! 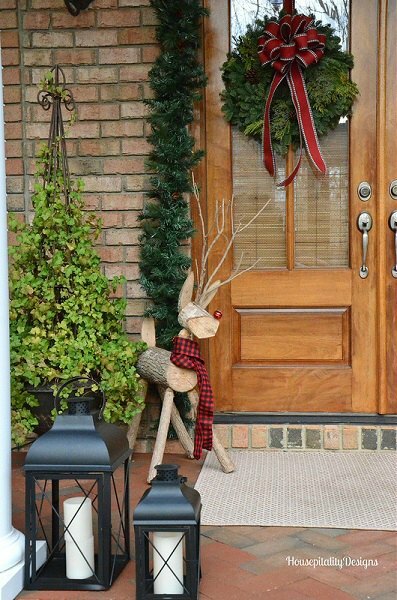 Every home needs a Rudolph! This one is made out of logs for a really rustic look. So pretty! 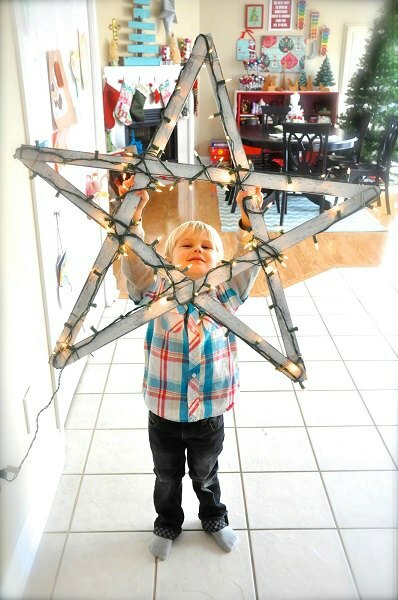 Make a giant star and string lights all around it for a spectacular porch! This will look so pretty when people are driving by. I love the tree branches that are lit up! 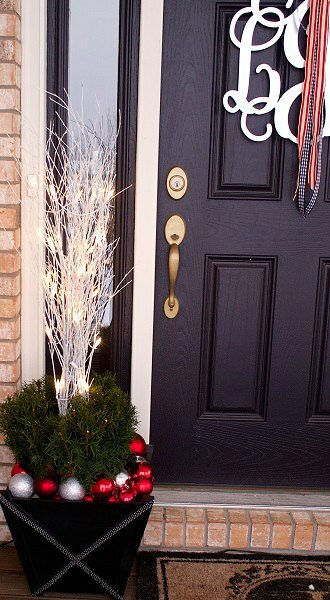 This is such a creative and festive idea for your front porch. 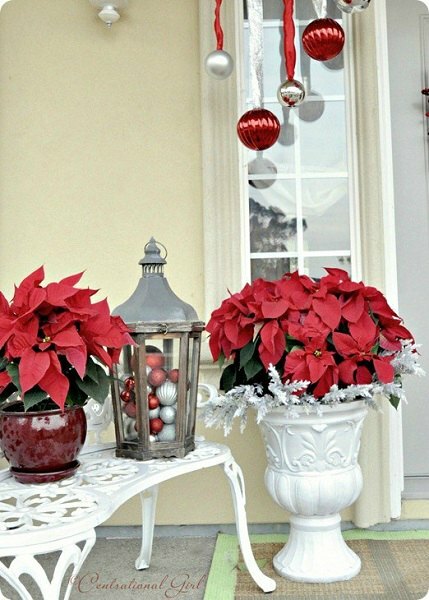 Poinsettias are classic for the holidays and what a perfect way to spruce up your porch. The red contrasts nicely against the white. 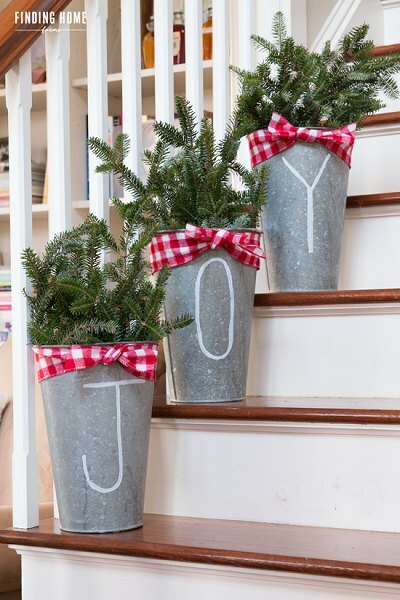 Decorate steps with galvanized tin buckets. Write letters to form “JOY”. This is gorgeous. 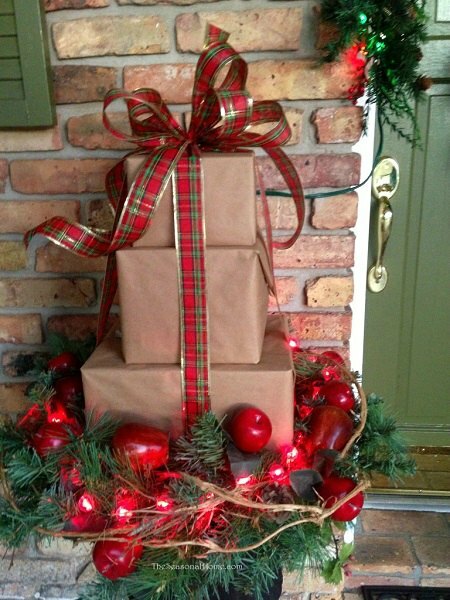 Red burlap and gold come together for the perfect Christmas display. 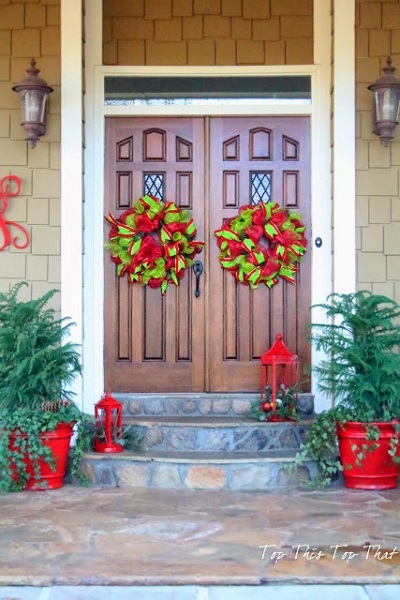 The wreaths and garland make this porch so welcoming. This idea is so clever! The base is chicken wire and it’s covered in shiny fabric! The lights make it look even better. 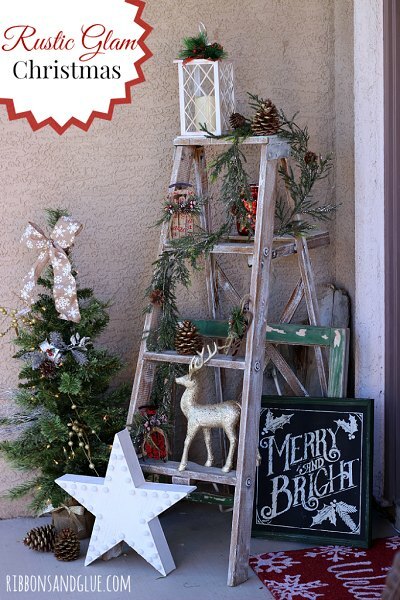 Turn an old ladder into rustic Christmas decor for your porch. I love ideas that use what you have. 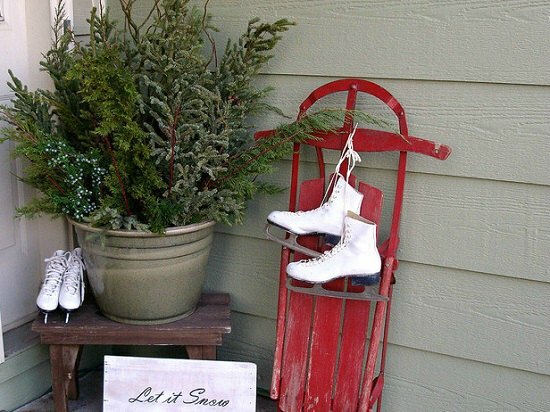 Prop up an old sled and you have the perfect vintage focal point for your porch. I bet you could even string lights. 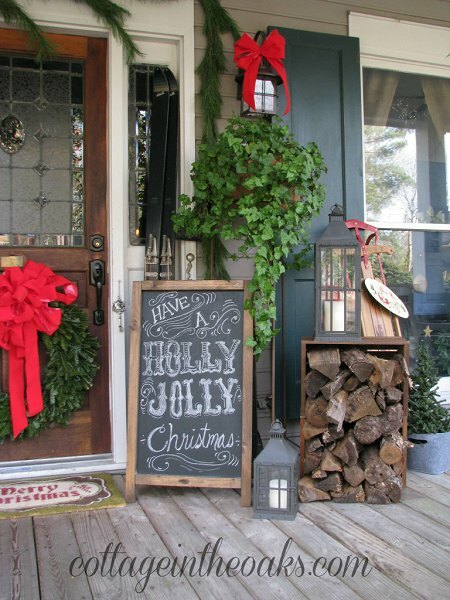 Turn a chalkboard into a seasonal sign to welcome guests! Love this idea. Make logs into snowmen! Add a cheery boy and you are set! 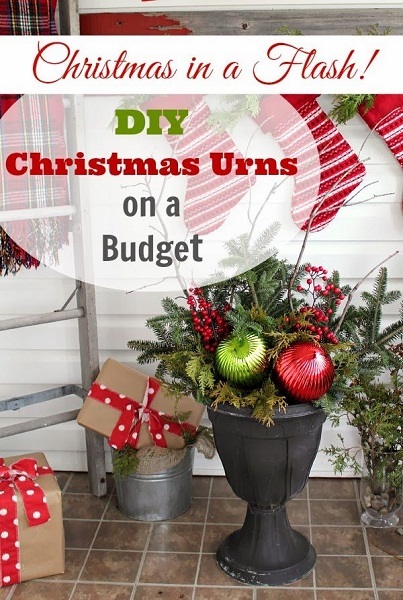 Use rustic planters to hold Christmas trees for your porch! This is perfect for a farmhouse look. If you have an old picture frame at home, turn it into decor! With a little spray paint and ribbon, you will have a gorgeous frame wreath. 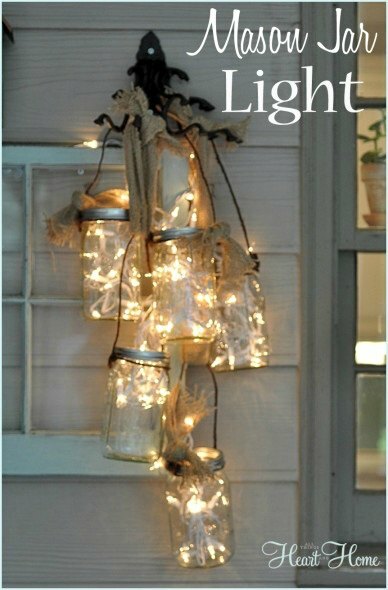 Mason jars full of twinkle lights make your porch glow with holiday cheer! This look is so simple yet gorgeous. 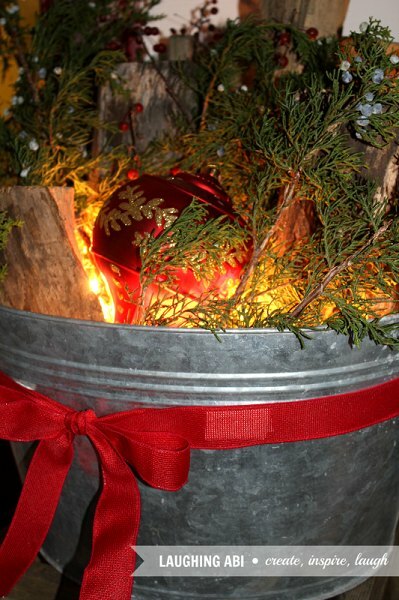 Fill a pretty bucket with all things Christmas and drape with lights. 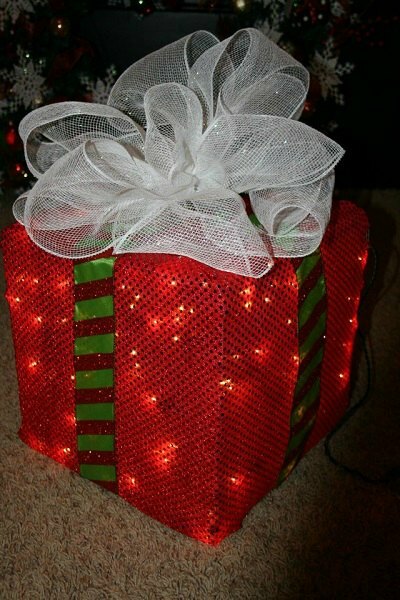 Your porch will look great with this light display. 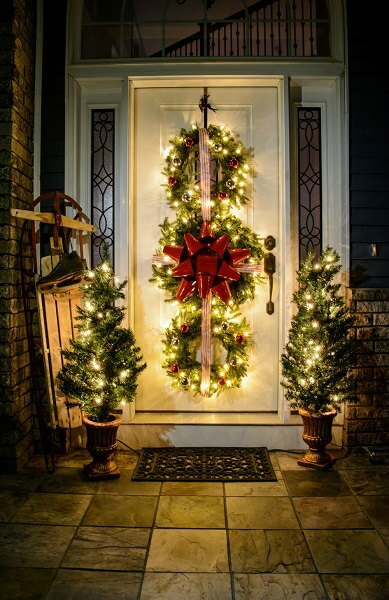 Hang multiple wreaths with lights to make your entire door the accent point of your porch. The triple wreaths will be stunning. This topiary of presents is the perfect addition to your porch. Add a little greenery and ribbon for a gorgeous accent. A simple plaid throw, an old Coca-Cola tray and fresh greenery complete the look for rustic porch decor. 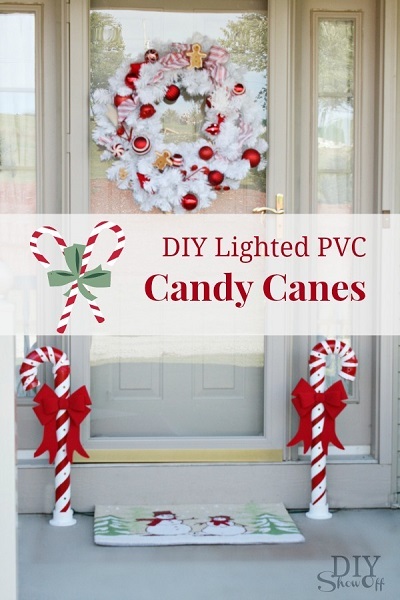 PVC pipes make really inexpensive and pretty candy canes. Wrap with ribbon for the stripe! 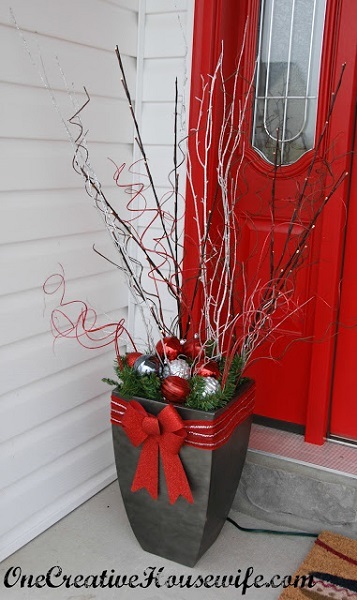 Turn your urns into a holiday masterpiece. 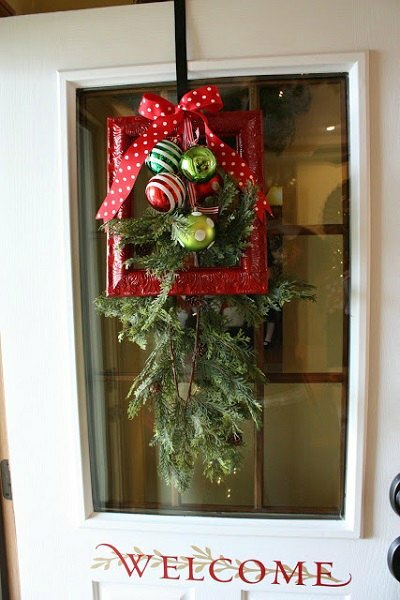 This is budget friendly and perfect for either side of your front door. 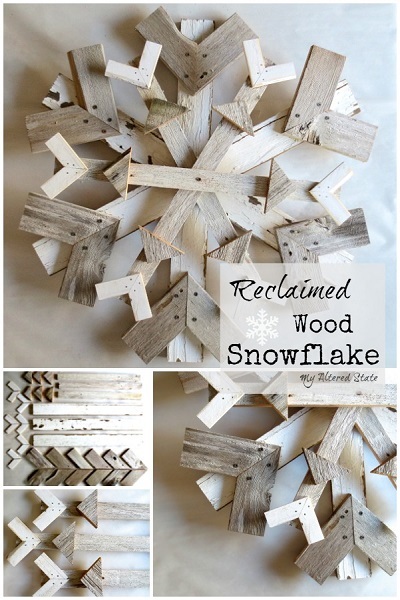 Use reclaimed wood to make snowflakes. This idea is so cool and very creative. 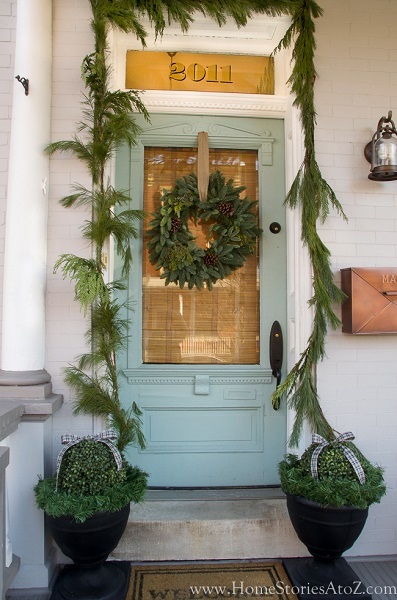 Drape your door with greenery for a welcoming entrance. 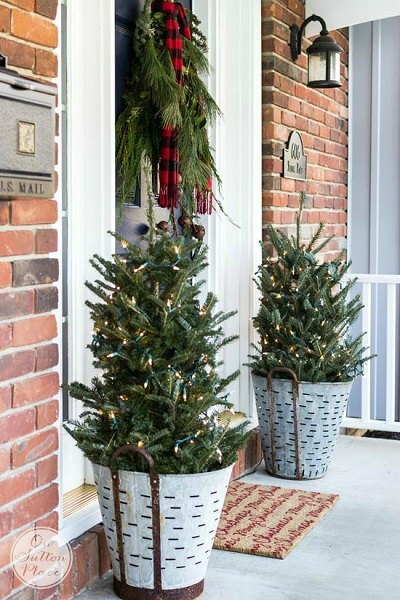 A fresh wreath and planters add to this holiday porch. Use branches with LED lights to turn your everyday planter into a holiday light display. Add a red bow and your look is complete. Gorgeous! 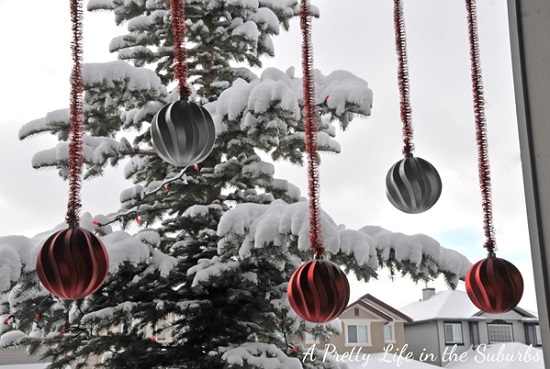 Use ornaments you have at home to make these hanging decorations. You can alternate colors for a fun look. 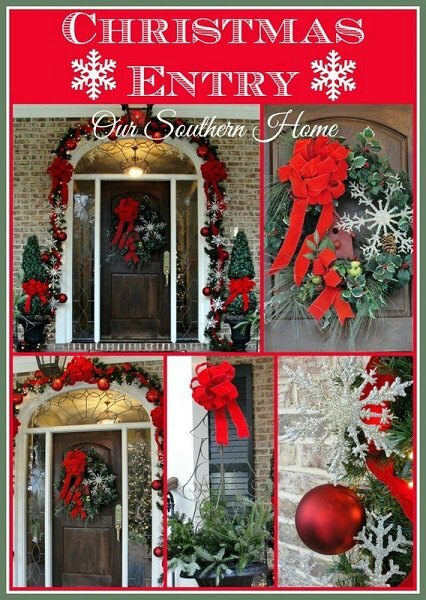 Deco mesh in red and green make gorgeous wreaths for your front door. Plus, you can often find this on sale at your local craft store. 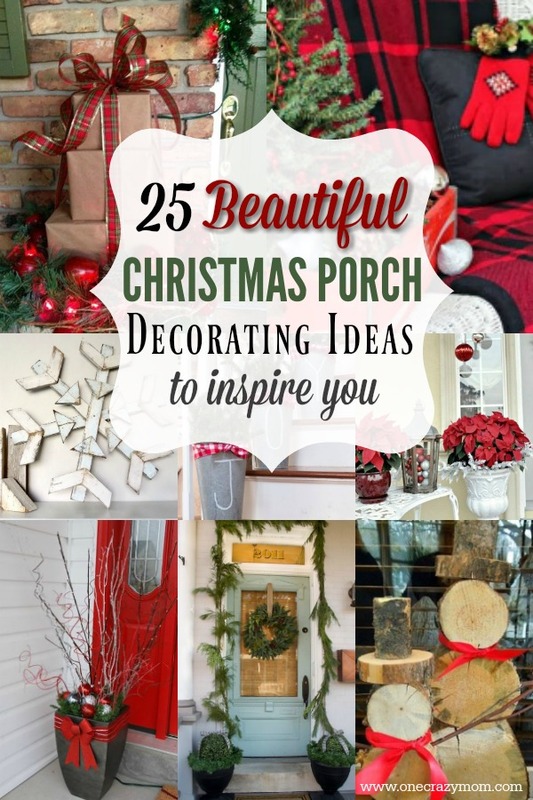 Now you have lots of stunning Christmas porch decorating ideas! I can’t wait to hear what you choose!